Goji Berry and Red Dates Herbal Tea is a delicately sweet delicious nourishing tea to revitalize blood, balances mood and spirit, beautifies the skin, delays aging, filled with antioxidants and just what your body needs to recover and heal. Red dates, or jujubes, are known as China’s “cure-all fruit” and have 70 to 80 times more vitamin C than grapes and apples. Chinese Red Dates are plump dried dates that are a deep red and have a pit on the inside and are naturally sweet and nourishing. 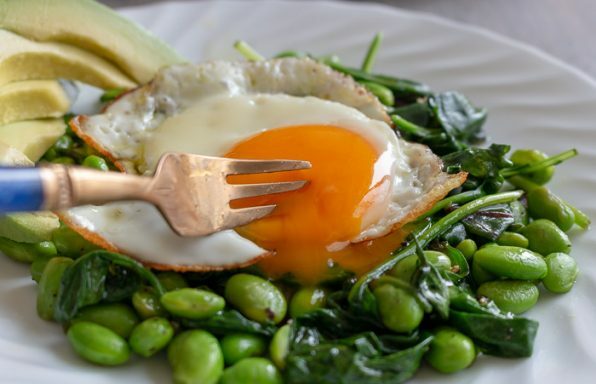 They’ve also got plenty of vitamin A, B1, B2, protein, calcium, phosphorus, iron and magnesium and are known for enriching and replenishing the blood (great for post-surgery, postpartum, or after a woman's period). Did you know that the month of May is International Pelvic Pain Month awareness month by the International Pelvic Pain Society? We could not think of a better way to bring attention to this issue then by making our readers aware of some natural herbal ways to prevent and treat pelvic pain. 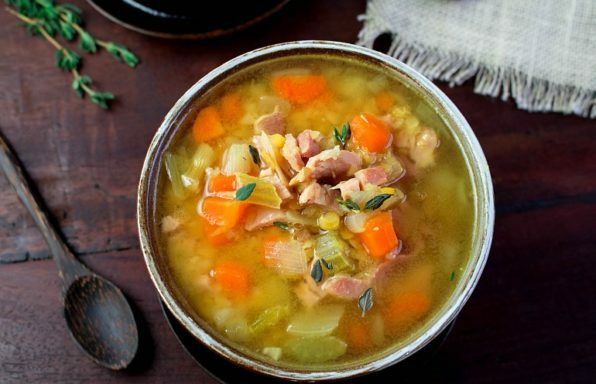 Healthy World Cuisine and Root + Spring are working together to feature a 3-recipe series with Goji Berry and Red Date Herbal Tea, Dried Ginger & Palm Coconut Tea and a Women’s Health Soup. Goji berries are known as Gou Qi Zi (also known as wolfberries, boxthorn, and matrimony vine) and have been part of the Chinese diet for over 2000 years and a common Traditional Chinese Medicine (TCM) supplement to prevent many ailments. The goji berries are red/deep orange in color and about the size of a raisin when dried. Goji berries are high in anti-oxidants and nutrients, improve immunity, promotes healthy skin, protects the eyes, stabilizes blood sugar, detoxifies the liver, elevates mood and help promotes fertility. 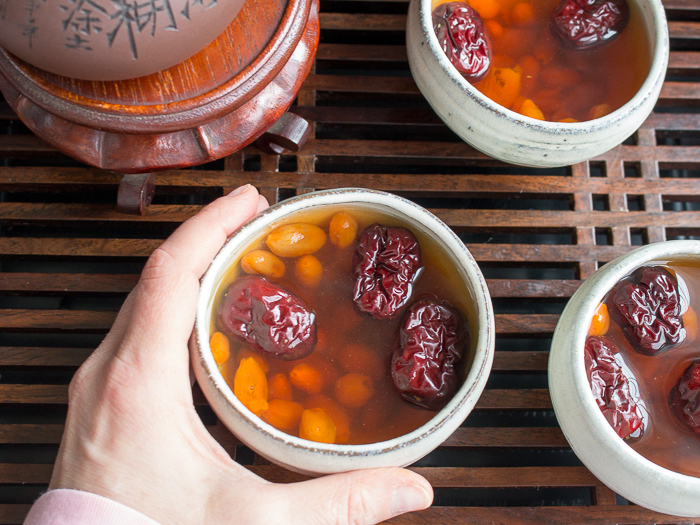 Traditional Chinese medicine (TCM) tends to believe that it goji berries treat common functions and are nourishing for the liver and kidney and help moisten the lungs. Goji berries are healthy. However, if you are currently taking warfarin (blood thinner), certain diabetes medications and certain blood pressure medicines you may want to speak with your health care provider before taking goji berries as they may interact. 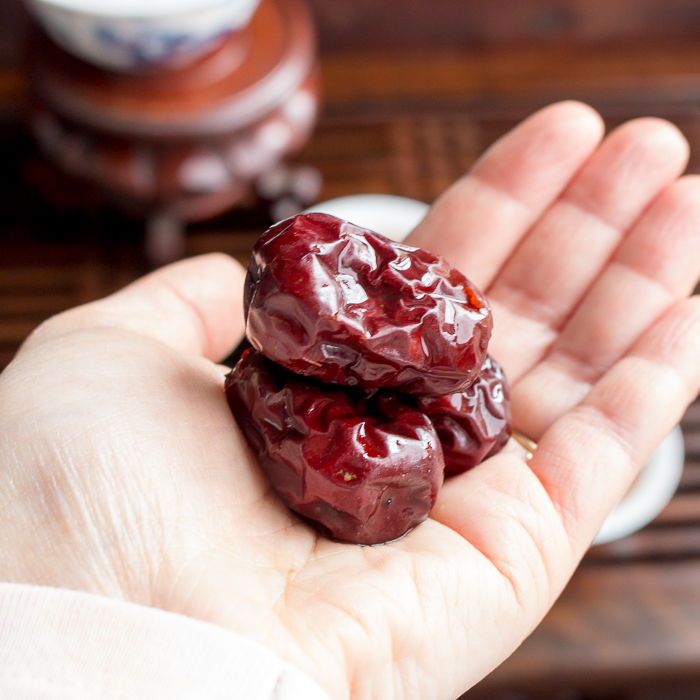 Both Goji berries and red dates have their different functions for maintaining health, but in general they help strengthening one’s qi and make the blood circulation better. 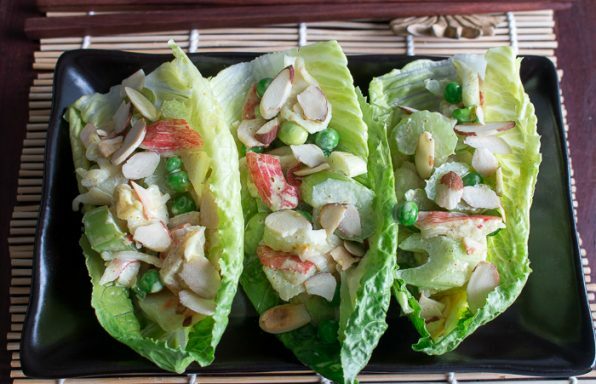 If a woman is looking to increase the health and circulation of blood, get glowing skin, and reap anti-aging properties, this is a great natural concoction to have regularly. 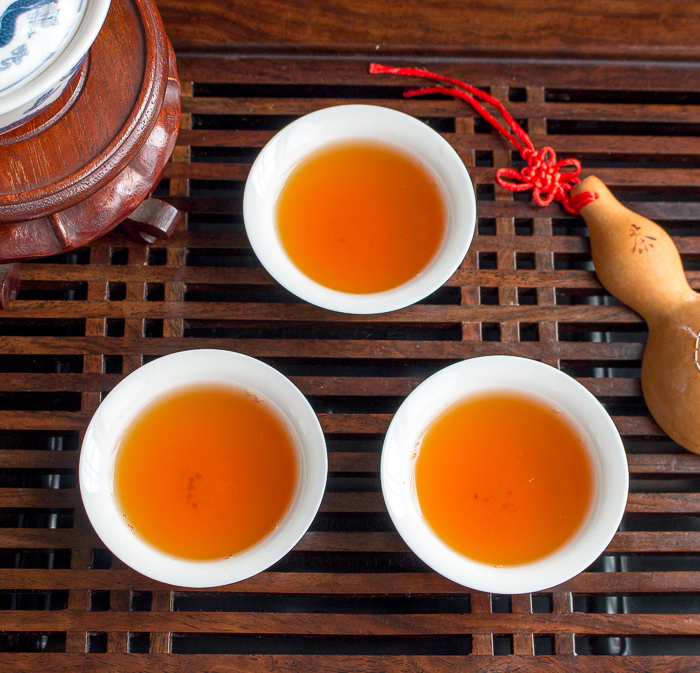 In terms of optimal timing of when to drink during the month, in correlation with a women’s menses, any time is fine if you have a small amount of the Goji Berries and Red Dates herbal tea regularly. Otherwise, the time after your menses finishes is most suitable because it is when you need to replenish the blood you have lost (especially if your menstruation is heavy or longer in duration). 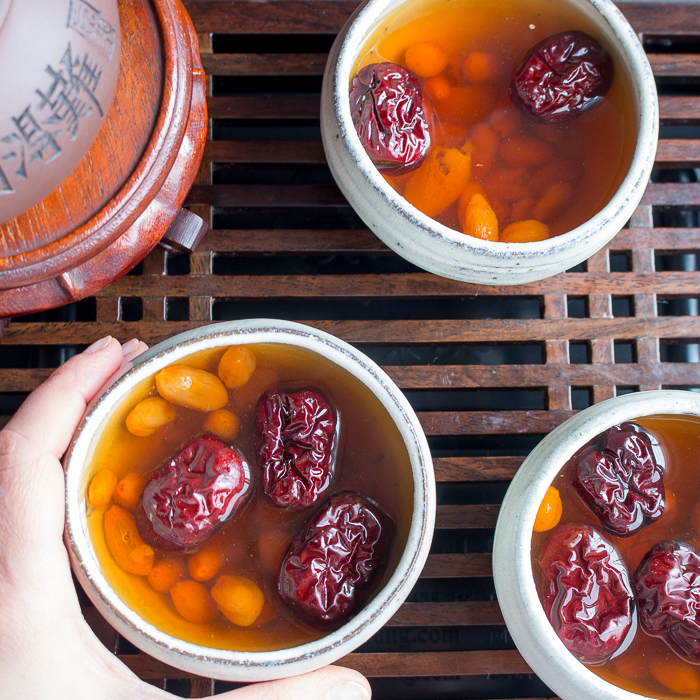 Almost all Chinese women follow that during the last part of their menstruation circle it is good to have some Goji Berries and Red Dates tea with rock sugar, because it can alleviate the pain of menstruation and help remove the old blood flow. A primary philosophy of TCM is that when there is not enough qi and blood or if the qi or blood are stuck in an area, it will cause an imbalance between Yin and Yang. Because of this imbalance, internal organs won't function optimally and illness and pain develop. Making sure you have a clean, healthy cycle is important not only for a manageable menses but to maintain overall order within your immune system and function. Hey we would would never leave you guys out! Did you know that goji berries and red dates herbal tea is super high in anti-oxidants and helps with infertility and helps increase sperm count. So, there you have it! This tea is not just for us girls. 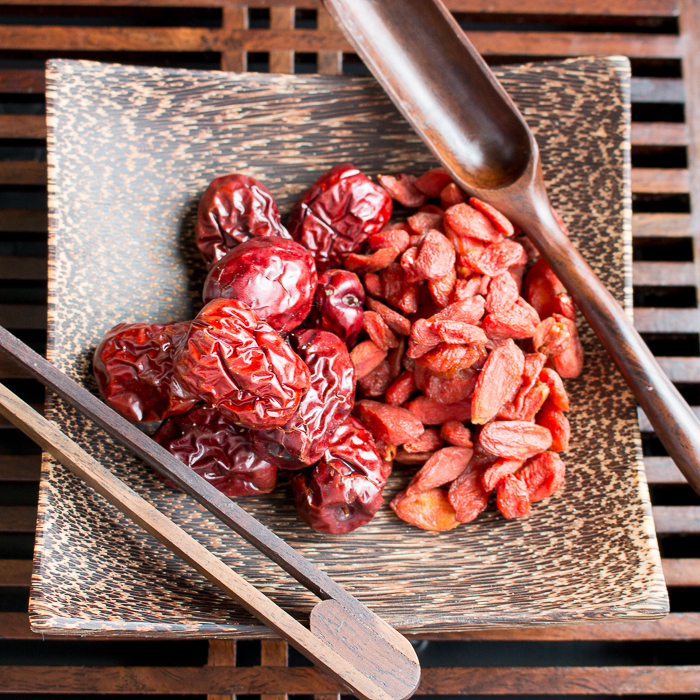 From a Western perspective, Goji berries can increase the blood flow in the body. When eaten in excess, they can speed of the blood flow goes up beyond normal and can cause adverse conditions. It may cause increased bleeding if taken during the menses and with hemophiliacs. Therefore, Goji Berry and Red Dates Herbal Tea should best be taken BEFORE or AFTER menses. If you suffer from "chronic excruciating pelvic pain" (endometriosis, pudendal neuralgia, IC, etc. or undiagnosed) don't suffer in silence. Feel free to reach out to us in confidence at [email protected] and we can help direct you to resources in your community or contact the International Pelvic Society. Goji Berries and Red Dates Tea is one delicious tea. 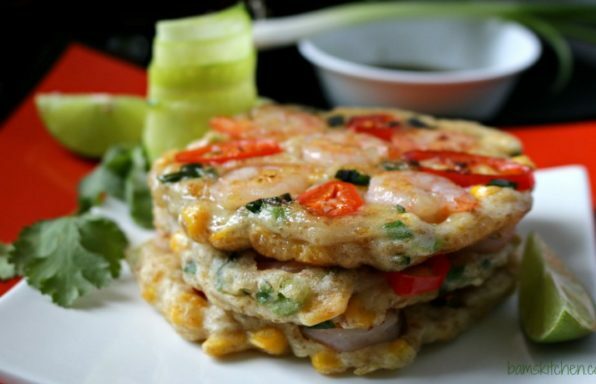 We prefer to drink it hot as it is soothing and delicious and best for digestion but it can also be served cool. 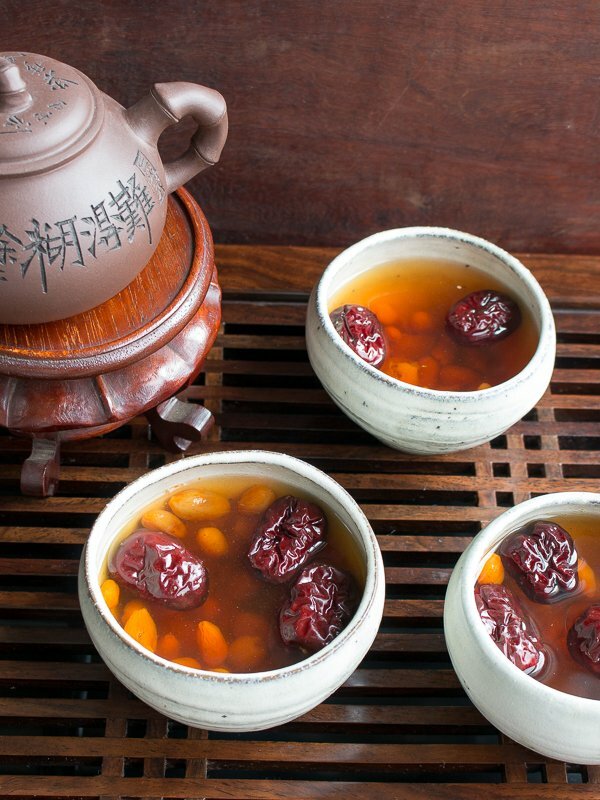 Chinese red dates are considered a warming food so take in moderation if have a heaty disposition. 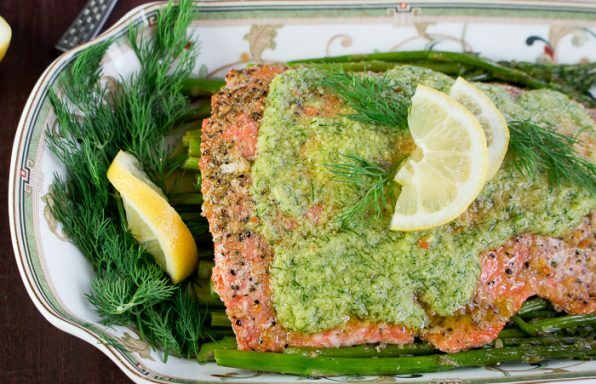 To learn what it means to have a heaty disposition, please read the 5 Energies of Food. 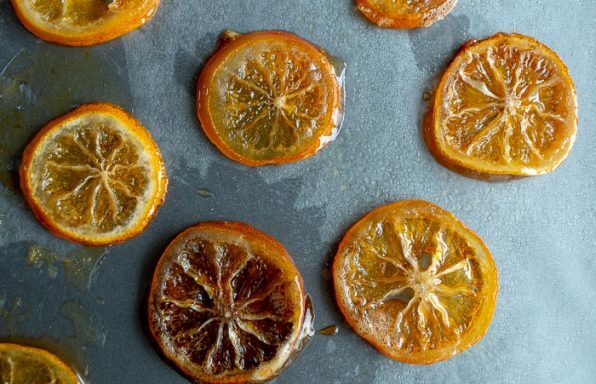 If you like your tea extra sweet, you can add some rock sugar. After you make your tea, feel free to eat the red dates but be mindful for the pit. 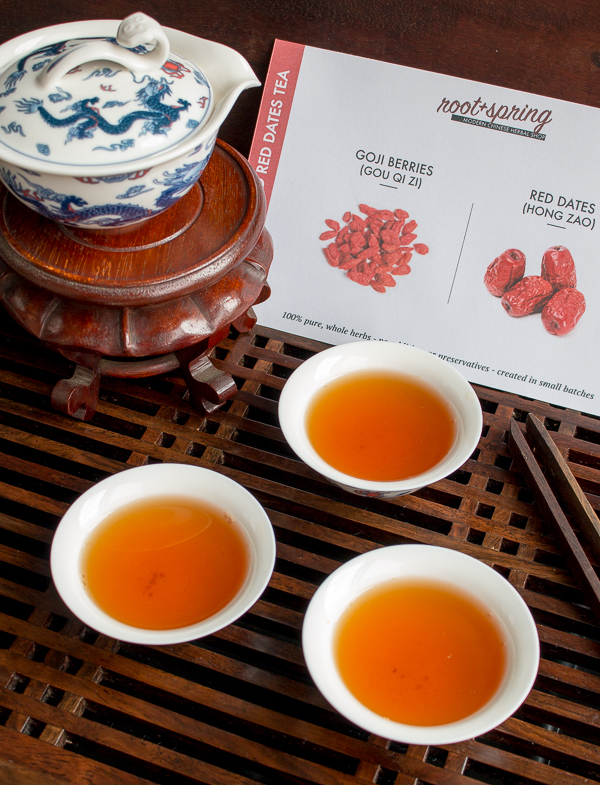 We find that the goji berries have pretty much lost their flavor after you brew the tea but the dates are super moist, sweet and delicious. 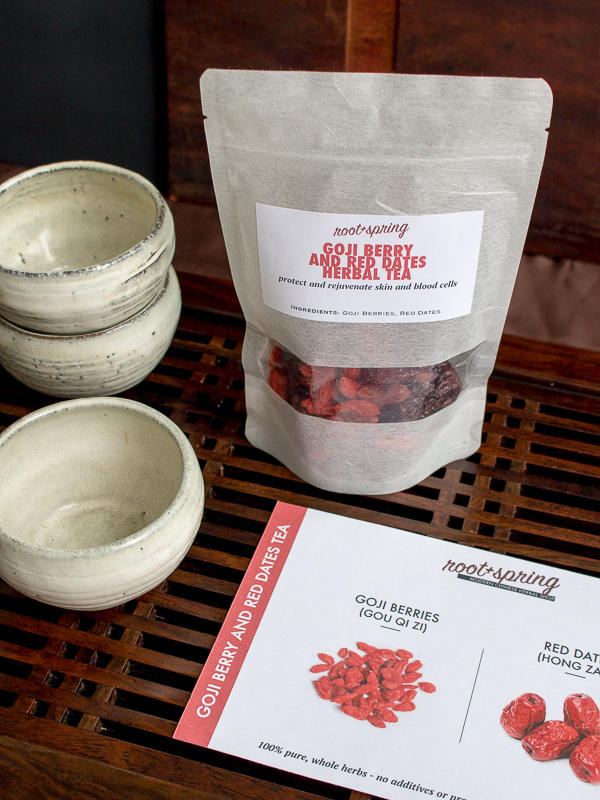 You can order Goji Berry and Red Dates Herbal Tea can be ordered on line from Root + Spring. This classic herbal mix good for, poor blood circulation, painful menstrual cycle, postpartum, insomnia, anxiety and cramps. Root + Spring is your go to online store for all your Traditional Chinese Medicine (TCM) and herbal needs. Root + Spring is a Chinese family-owned medicine shop located in Los Angeles, California, USA. They provide a selection of popular patent medicine and handcraft exceptional herbal soup and tea blends in small batches. 1Give the goji berries and red dates a gentle rinse under cool, running water. 2In a pot, combine the goji berries, red dates and water. 3Cover and bring to a boil before lowering heat and simmering for an hour. 4If you prefer your tea sweeter, stir in rock sugar until dissolved. 5Goji berry and red dates herbal tea can be enjoyed hot or cold.